To say that I am shocked is an understatement. I only hope fervently, that the actor who has in the past lashed out against academics and writers, doesn't know the historical context of the word 'pest' /cockroaches/vermin being used consistently during genocides. It is also unclear to me whether he was referring to citizens involved in the JNU controversy, the Jat agitation or to some other people . However, the seriousness of using a term like 'pest' to describe any group of humans, cannot be over-emphasized. Some journalists like Rajdeep Sardesai and others, immediately pointed out on Twitter how the word pest was used by the Nazis during the Holocaust to describe their Jewish victims. However, it goes far beyond that one instance. Words like 'pests', 'vermin' and 'cockroaches' have regularly been used before to refer to victims of genocide. 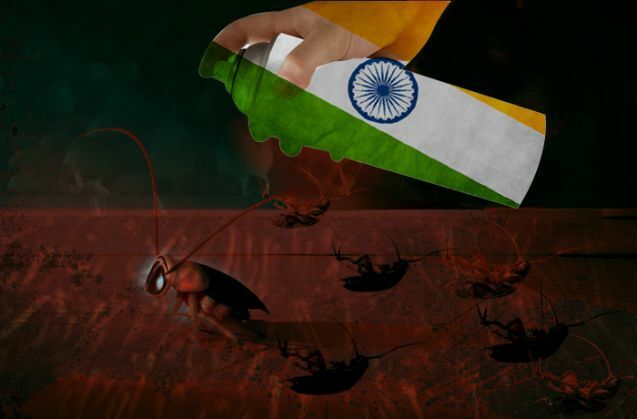 This process in conflict studies is called "dehumanisation" and its purpose is to reduce victims to being less than human, akin to insects and pests who need to be 'cleansed' from society. By calling them less than human, the victims are deprived of human like qualities and attributes, assuaging the guilt of the perpetrators. Similarly, during the holocaust, the Germans referred to the Jews as 'vermins/lice, parasite/infections'; and during the Cambodian genocide the Khmer Rouge referred to the Buddhist monks as 'leeches' and 'blood suckers'. There are dozens of other examples during mass killings and genocides. Adama Dieng,the United Nations Secretary General's Special Adviser on Prevention of Genocide, said this in 2014: "The Holocaust did not start with the gas chambers and the Rwandan genocide did not start with the slayings. It started with the dehumanization of a specific group of persons". Genocide Watch has classified 10 stages of genocide of which the fourth stage is of dehumanisation. Dehumanisation simply means that, "members of it are equated with animals, vermin, insects or diseases. Dehumanization overcomes the normal human revulsion against murder. At this stage, hate propaganda in print and on hate radios is used to vilify the victim group". However, Genocide Watch also points out that none of these stages are linear, can be stopped at any time and that genocidal societies are different from democracies. Apart from Anupam Kher's use of 'keeda-makoda' to describe some Indians, I have seen the recurring terminology of 'cleansing' on Twitter lately, especially in reference to the JNU controversy. Claiming to belong to a right wing ideology, a young man on Twitter said that he had been made in charge of 'internal cleansing'. On being asked who had made him in charge or what measures consisted of the said 'cleansing', he refused to elaborate. A similar claim was made by another young man of the same ideological persuasion. Another comment on a Facebook page referred to student protestors of some universities as 'little snakes'. Now, these may very well be meaningless words used in anger, but the fact that they are being bandied about consistently should make India a little uncomfortable. I'm by no means saying that a few words take India any closer to any kind of genocide. The machinations of a democracy are different than a genocidal society; with much stronger checks, balances and legal measures; but we need to remember that words have power and we should watch others and ourselves as to the words we use for fellow citizens, even if we don't agree with their views. 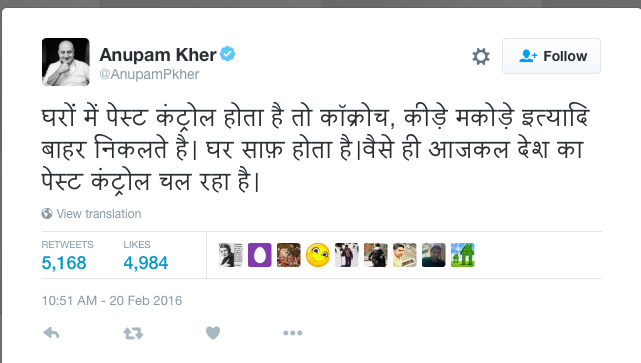 Mr. Kher would do well to remember that. READ NEXT >> #JatQuotaStir: here's how Haryana CM Khattar unravelled. Can he recover?